Learn here how to clean the print heads Epson Stylus TX110. 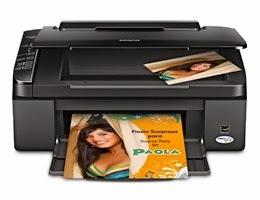 If the prints are coming out blurry or clear grates on all pages have to try to solve this problem through the tools that gives us the Epson printer software, we have access to a printer heads and do not sell replacements these anywhere. Also the images may be different and very opaque colors, we must make a quality setting in the printer, this involves cleaning the print head, align the print head and possibly clean the carriage path. The first thing to do is clean the printhead, this is a simple process where we will make the printer use more ink than normal to go through the heads, this attempt to uncover the heads, as you know the head in a printer is the most important parts are always recommended to use the printer at least once a week so that they will don maintain the necessary fluidity in covered. Then head cleaning can be done in two ways, one standard cleaning head and clean Epson head thoroughly cleaning normal spindle is less effective at the time of cleaning, this is recommended as the first if there is the possibility that the head is uncovered, and cleaning head to bottom of the Epson print heads are the last option, these if they can not be done often, they decrease the amount of ink in the fast cartridges and often sponges fill ink. Before starting the cleaning head the Epson Stylus TX110 printer we have to check if this really need to know if you need to clean the heads have to check the print head nozzles to print this page we have press a combination of buttons on the front panel of your printer. 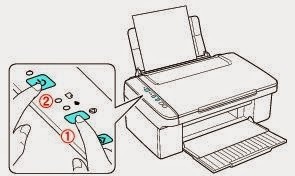 Press the cancel button on the printer, hold this down and then press the power button on the printer. When the printer starts blinking release the power button the cancel button. We can also make an impression for the nozzle check using the printer software, usually we go to printers, faxes or printing devices and right-click the printer properties, then select maintenance and the print option check injectors. Already been checked injectors proceed to head cleaning, as mentioned above can make cleaning heads or normal head cleaning thoroughly. To make cleaning head normal form from the front panel of the printer follow the steps below, keep in mind that we need to have your printer up and running without errors, the need to have enough ink cartridges and this cleaning will normally, and if you want to perform a thorough cleaning has to do it through the printer software. Should you require further assistance please contact us, usually ink cartridges after these cleaning processes we reduce ink levels exaggerated manner.